With their recent battles behind them, Rom and Starshine are off to find the next Wraith menace when Rom suddenly recoils from her. In light of everything that has happened recently, Rom is having a bit of a crisis of conscience and is hurting deeply. More than ever, he feels more machine than man and because of that he thinks that the emotions he and Brandy feels are false and cannot truly exist. So even though he is hurting, which is a truly human emotion, he does not want to accept that Brandy could love him, or he love her. 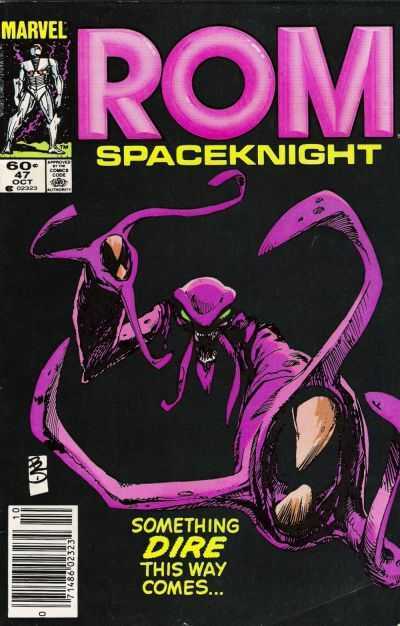 While the book does spend some time on some really great character moments, Bill Mantlo provides a little conflict as well as our two heroes fly onto an island that seems more than mysterious and they meet a creature who seems like a combination of the Impossible Man and Mojo. Overall, the story is a good one and quite dramatic at its core but the one weakness that does rear its head is the choice of villain. After so many issues featuring exceedingly strong stories and bad guys who were not only pure evil, but more than a match for Rom, this tale is a bit of a letdown in that respect. One thing that this series does not need is silly. It really seems out of place and when you put it alongside the other plot elements that Mantlo has written, it is a little ridiculous. The good thing though is that this story was a single issue tale and our heroes will soon be on to bigger and better adventures.